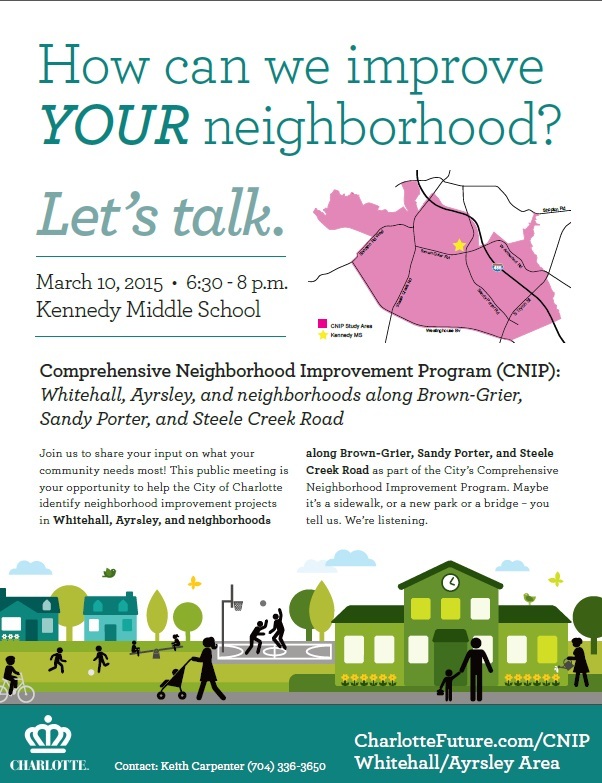 (February 28, 2015) Charlotte city staff and consultants will be holding the first public meeting on the Whitehall/Ayrsley Comprehensive Neighborhood Improvement Program (CNIP) on Tuesday, March 10 from 6:30 to 8:00 PM at Kennedy Middle School. Charlotte has identified five neighborhoods where it plans to make strategic investments to address a broad array of community needs. One of these is the Whitehall/Ayrsley area of Steele Creek, including Berewick and neighborhoods along Brown-Grier Road, Sandy Porter Road, and Steele Creek Road. At the meeting, they will be requesting input on what the community needs most. See also Charlotte Plans $30 M Capital Expenditures in Whitehall-Ayrsley Area. Staff also will be giving a presentation on the Whitehall/Ayrsley CNIP at the Steele Creek Residents Association Annual Meeting on March 12 at Christ the King Church.